An R port of Stata's 'margins' command, which can be used to calculate marginal (or partial) effects from model objects. The margins and prediction packages are a combined effort to port the functionality of Stata's (closed source) margins command to (open source) R. The major functionality of margins - namely the estimation of marginal (or partial) effects - is provided through a single function, margins(). This is an S3 generic method for calculating the marginal effects of covariates included in model objects (like those of classes "lm" and "glm"). Users interested in generating predicted (fitted) values, such as the "predictive margins" generated by Stata's margins command, should consider using prediction() from the sibling project, prediction. Stata's margins command is incredibly robust. It works with nearly any kind of statistical model and estimation procedure, including OLS, generalized linear models, panel regression models, and so forth. It also represents a significant improvement over Stata's previous marginal effects command - mfx - which was subject to various well-known bugs. While other Stata modules have provided functionality for deriving quantities of interest from regression estimates (e.g., Clarify), none has done so with the simplicity and genearlity of margins. By comparison, R has no robust functionality in the base tools for drawing out marginal effects from model estimates (though the S3 predict() methods implement some of the functionality for computing fitted/predicted values). The closest approximation is modmarg, which does one-variable-at-a-time estimation of marginal effects is quite robust. Other than this relatively new package on the scene, no packages implement appropriate marginal effect estimates. Notably, several packages provide estimates of marginal effects for different types of models. Among these are car, alr3, mfx, erer, among others. Unfortunately, none of these packages implement marginal effects correctly (i.e., correctly account for interrelated variables such as interaction terms (e.g., a:b) or power terms (e.g., I(a^2)) and the packages all implement quite different interfaces for different types of models. 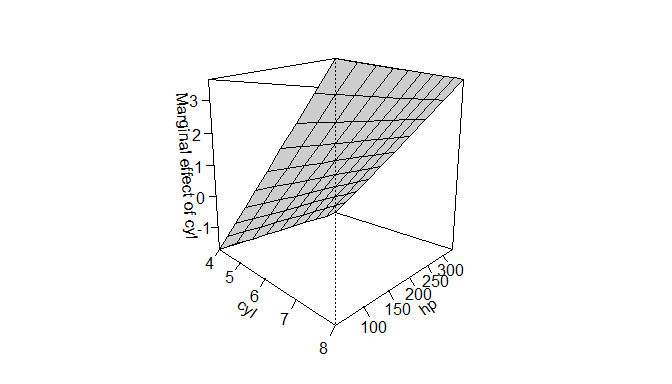 interflex, interplot, and plotMElm provide functionality simply for plotting quantities of interest from multiplicative interaction terms in models but do not appear to support general marginal effects displays (in either tabular or graphical form), while visreg provides a more general plotting function but no tabular output. interactionTest provides some additional useful functionality for controlling the false discovery rate when making such plots and interpretations, but is again not a general tool for marginal effect estimation. Given the challenges of interpreting the contribution of a given regressor in any model that includes quadratic terms, multiplicative interactions, a non-linear transformation, or other complexities, there is a clear need for a simple, consistent way to estimate marginal effects for popular statistical models. This package aims to correctly calculate marginal effects that include complex terms and provide a uniform interface for doing those calculations. Thus, the package implements a single S3 generic method (margins()) that can be easily generalized for any type of model implemented in R.
Some technical details of the package are worth briefly noting. The estimation of marginal effects relies on numerical approximations of derivatives produced using predict() (actually, a wrapper around predict() called prediction() that is type-safe). Variance estimation, by default is provided using the delta method a numerical approximation of the Jacobian matrix. While symbolic differentiation of some models (e.g., basic linear models) is possible using D() and deriv(), R's modelling language (the "formula" class) is sufficiently general to enable the construction of model formulae that contain terms that fall outside of R's symbolic differentiation rule table (e.g., y ~ factor(x) or y ~ I(FUN(x)) for any arbitrary FUN()). 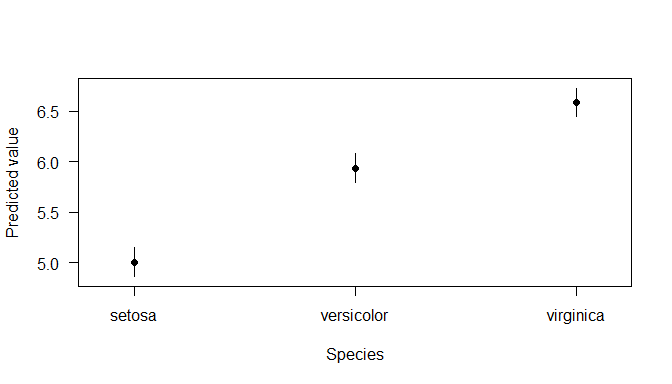 By relying on numeric differentiation, margins() supports any model that can be expressed in R formula syntax. Even Stata's margins command is limited in its ability to handle variable transformations (e.g., including x and log(x) as predictors) and quadratic terms (e.g., x^3); these scenarios are easily expressed in an R formula and easily handled, correctly, by margins(). With the exception of differences in rounding, the above results match identically what Stata's margins command produces. These functions may be useful for plotting, getting a quick impression of the results, or for using unit-specific marginal effects in further analyses. This functionality removes the need to modify data before performing such calculations, which can be quite unwieldy when many specifications are desired. A plot() method for the new "margins" class that ports Stata's marginsplot command. A plotting function cplot() to provide the commonly needed visual summaries of predictions or average marginal effects conditional on a covariate. A persp() method for "lm", "glm", and "loess" objects to provide three-dimensional representations of response surfaces or marginal effects over two covariates. An image() method for the same that produces flat, two-dimensional heatmap-style representations of persp()-type plots. The numerous package vignettes and help files contain extensive documentation and examples of all package functionality. The most computationally expensive part of margins() is variance estimation. If you don't need variances, use marginal_effects() directly or specify margins(..., vce = "none"). Fix a small issue in print() and summary() methods related to the release of prediction 0.3.6. Modified the internals of gradient_factory() to be more robust to an expanded set of model classes through the introduction of an internal function reset_coefs(). A test suite for this function has been added. Added support for objects of class "ivreg" from AER. margins.default() now attempts to calculate marginal effect variances in order to, by default, support additional model classes. The "at" attribute returned by margins() now contains the input value passed to the at argument to the function. New attribute "at_vars" returns a character vector of variables specified therein. The data frame returned by margins() now contains an added column "_at_number", which specifies which at combination a row comes from. This may be changed or removed in the future, but is useful for matching subsets of the data frame to corresponding entries in the "vcov" and "jacobian" matrices. Continued to update behavior of internal function find_terms_in_model(). Fixed a bug in survey-weighted objects involving weights and expanded the test suite to cover these cases. data.table::rbindlist() is used instead of base::rbind() inside dydx(). Changed some internal representations from data frames to matrices in an effort to improve performance. marginal_effects() and dydx() gain an as.data.frame argument to regulate the class of their responses. Internal calls to prediction::prediction() were halved by stacking data frames used in calculating numerical derivatives (inside dydx() methods) and then splitting the resulting predicted value vectors. Added an (internal use only) argument, varslist, to marginal_effects() and several internal functions that significantly improves performance. The performance gain is due to computational cost of identifying terms in model formulae each time marginal_effects() was called, which occurred repeatedly (e.g., during variance estimation). By performing this once at the margins()-level and passing the argument throughout, margins() is perhaps twice as fast as in versions <= 0.3.9. But, importantly, note that this argument should not be specified by end users! Some internal edits were made to the formula-processing functions find_terms_in_model() and clean_terms(), removing many regex calls with the goal of improving performance. Removed compiler dependency, which appeared to not improve performance. Added method for "svyglm" from survey. Improved handling of survey-weighted estimates. Removed weight-related warnings from margins() for unweighted models. print() and summary() now handle survey-weighted marginal effects. Fixed "margins" object structure in margins.merMod(). build_margins() is no longer exported. Arguments used to control its behavior have been exposed in margins() methods. The at argument in plot.margins() has been renamed to pos, to avoid ambiguity with at as used elsewhere in the package. persp() and image() methods gain a dx argument (akin to that in cplot()) to allow visualization of marginal effects of a variable across levels of two other variables. The default behavior remains unchanged. Cleaned up documentation and add some examples. Added support for "merMod" models from lme4, though no variance estimation is currently supported. 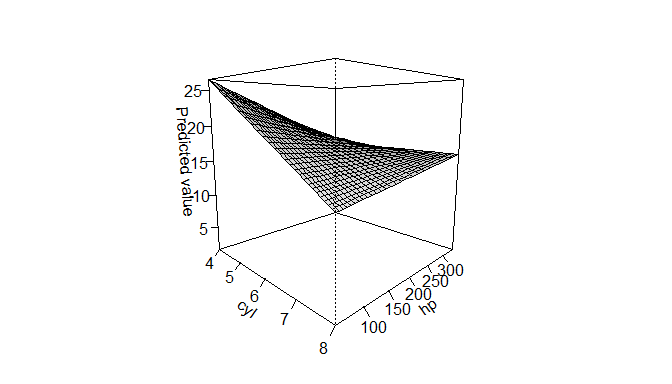 Imported prediction::mean_or_mode() for use in cplot() methods. Moved the build_datalist() and seq_range() functions to the prediction package. A tentative cplot.multinom() method has been added. A new cplot() method for objects of class "polr" has been added (#49). The extract_marginal_effects() function has been removed and replaced by marginal_effects() methods for objects of classes "margins" and "marginslist". Various errors and warnings that occurred when applying margins() to a model with weights have been fixed. 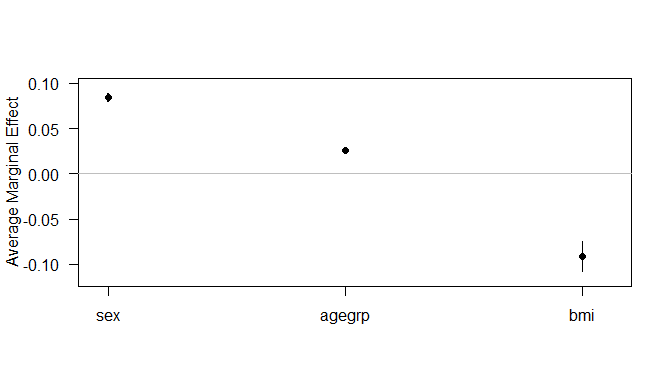 cplot() now issues an error when attempting to display the effects of a factor (with > 2 levels). 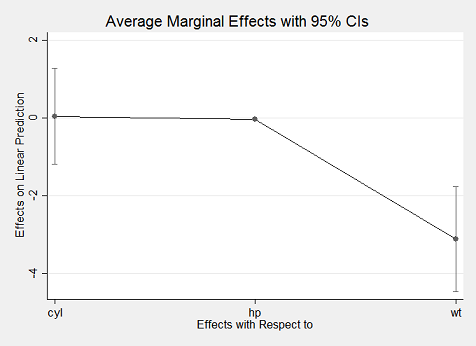 Fixed a bug in get_effect_variances(vce = "bootstrap"), wherein the variance of the marginal effects was always zero. Factored the prediction() generic and methods into a separate package, prediction, to ease maintainence. Added a print.summary.margins() method to separate construction of the summary data frame the printing thereof. The "Technical Details" vignette now describes the package functionality and computational approach in near-complete detail. Added support in dydx.default() to allow the calculation of various discrete changes rather than only numerical derivatives. Reconfigured the data argument in margins() and prediction() to be clearer about what is happening when it is set to missing. Changed the capitalization of the variances field in "margins" objects (to lower case), for consistency. Fixed some small errors in documentation and improved width of examples. prediction() returns a new class ("prediction") and gains a print() method. Internal function get_effect_variances() gains a "none" option for the vce argument, to skip calculation of ME variances. 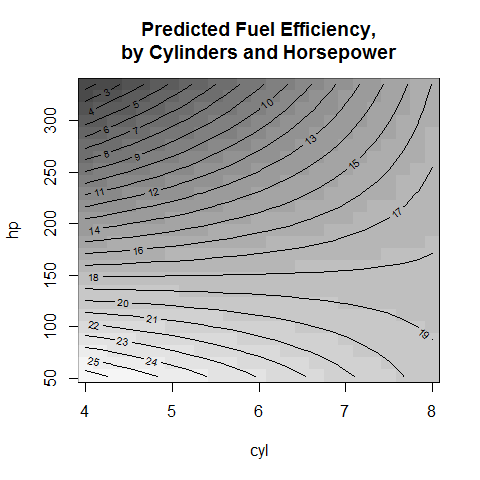 Added better support for factor x variables in cplot(). Removed .build_predict_fun() factory function, as it was no longer needed. Removed margins.plm() method, which didn't actually work because "plm" does not provide a predict() method. Updated Stata/R comparison documents included in inst/doc. build_margins() now returns columns containing unit-specific standard errors of marginal effects. 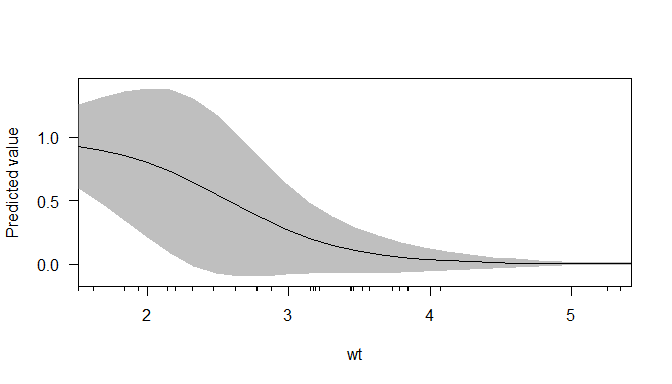 cplot() now draws confidence intervals for "effect" plots. Fixed a bug in get_marginal_effects() wherein the method argument was ignored. This improves performance significantly when using method = "simple" (the default differentiation method). Added persp() methods for "lm" and "glm" class objects to display 3-dimensional representations of predicted values and marginal effects. 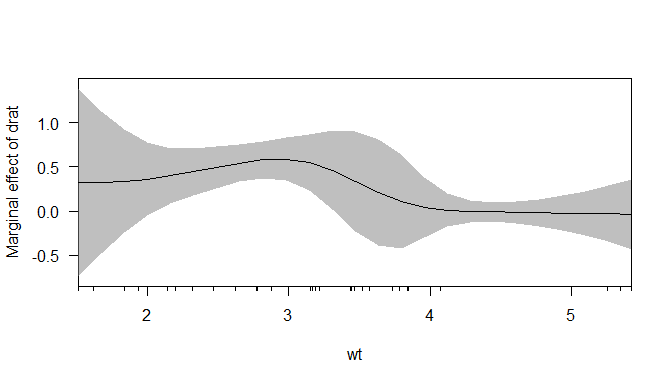 Added plot.margins() method for mimicking Stata's marginsplot behavior. Added cplot() generic and methods for "lm" and "glm" class objects to display conditional predictions and conditional marginal effects in the style of the interplot and plotMElm packages. Added various variance estimation procedures for marginal effects: delta method (the default), bootstrap, and simulation (ala Clarify). Fixed estimation of marginal effect variances for generalized linear models, so that they are correct on both "link" and "response" scales. Exposed two internal marginal effect estimation functions. First, build_margins() is called by margins() methods (perhaps repeatedly) and actually assembles a "margins" object from a model and data. It is never necessary to call this directly, but may be useful for very simple marginal effect estimation procedures (i.e., using original data with no at specification). Second, marginal_effects() is the very low level function that differentiates a model with respect to some input data (or calculate discrete changes in the outcome with respect to factor variables). This is the fastest way to obtain marginal effects without the overhead of creating a "margins" object (for which variance estimation is fairly time-consuming). 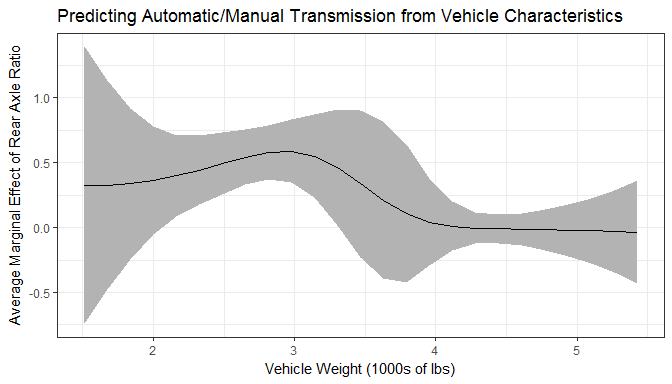 Implemented estimation of "discrete change" representations of marginal effects of factor variables in models, ala Stata's default settings. Re-implemented marginal effects estimation using numeric derivatives provided by numDeriv::grad() rather than symbolic differentiation. This allows margins() to handle almost any model that can be specified in R, including models that cannot be specified in Stata. Used compiler to byte compile prediction and gradient fucntions, thereby improving estimation speed. The internal build_datalist() now checks for specification of illegal factor levels in at and errors when these are encountered. Use the webuse package to handle examples.